Data literacy is very low. As the amount of data increases, the need for people to understand the data also increases. We have the know-how, experience, and a team of data scientists to train your team and help them not only understand, but, leverage data science to its full potential. In case of organizations that already have a team of data analysts, the best option is to opt for data science training for corporates as it helps in enhancing the skills of their employees. Businesses, both large corporates and, start-ups alike, can benefit from trained data scientists who are highly competent and industry-ready. Data science training for corporates empowers professionals to provide quantifiable data-driven evidence, identify trends and opportunities, and empower management to make informed decisions. Our unique classroom training is tailored to precisely address the specific skill requirements of three types of stakeholders, which are the CXOs, middle level management, and the technologists. 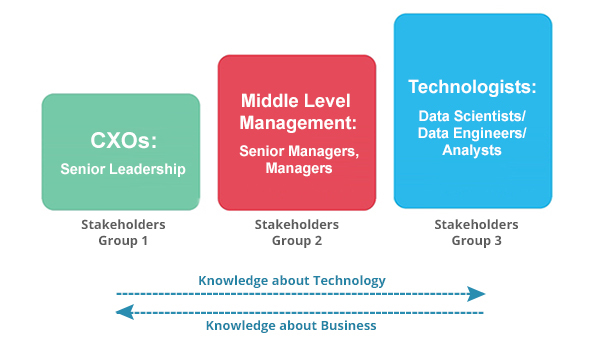 For each of these stakeholder groups, we have a tailored classroom training program. We understand that the right mentorship can help you effectively manage the disruption in the technology and hence we build capabilities for performance. Our sessions include intensive hands-on training programs to solve the real-world business challenges. The training sessions we provide offer hands on practice, a wealth of live use cases, and online/phone support post-training. We are always at the forefront of changes in the market. In addition, our course modules are continually tailored to meet your requirements. Our data scientists, with deep big data analytics expertise, will empower you to take business decisions and to derive valuable insights from your big data. Our programs will have a direct and measurable impact on your key performance indicators. Being a flagship digital data science learning academy, the curriculum is designed to cater to vertical-specific needs. We have several modules of quality content segregated by levels such as basic, intermediate, and advanced along with strong a team of mentors for offline support. Users receive a certificate with total credits achieved and personalized statistics with information around courses done, test scores etc. User activity can integrate with Human Resource Management tools and can be integrated with mobile technology. These are engaging and interactive e-learning courses with content created to go through formative and summative evaluations. The digital learning academy provides a wealth of use cases, case-studies, and hands on practice. The content is customized to match the unique requirements of a specific domain. If client has a specific dataset, that they want us to customize the training program around, we can do that too. This ensures the training is relevant and relatable. The content is designed by mentors that are certified data scientists and are practitioners of data science. Hence, the content is healthy mix of applied data science and academic concepts. Modules prepares participants to take up global-level certification examinations, for example, after attending our Big Data and Hadoop training program, participants are well prepared to take up global certification examinations from Cloudera and Hortonworks. 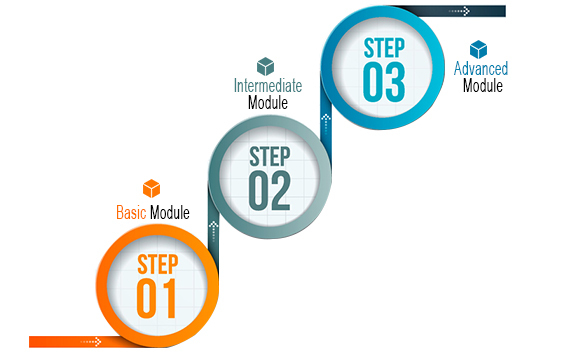 Our modules have a direct and measurable impact on client's key performance indicators. The content of our training is designed by mentors that are certified data scientists and are practitioners of data science. All our professionals carry years of multi-domain industry experience and also constantly upgrade themselves with the new developments in the industry. This was achieved with the support provided by our team of eminent data scientists, architects, and engineers having decades of experience in big data and machine learning. They are actively engaged in developing solutions for structured and unstructured data. Open source software like Python/"R"
What Are the Benefits of Our Data Science Training for Corporates? Why Choose Outsource2india for Data Science Training for Corporates? Outsource2india is a leading outsourcing firm providing a gamut of data science to global clients. Being in the outsourcing industry for over 20 years now, we are equipped to precisely cater to specific training requirements of the clients. Besides, data science training services, we also offer automatic document classification and lead scoring services. If you are looking for top-quality data science training for corporates, then you are at the right place. Just get in touch now.